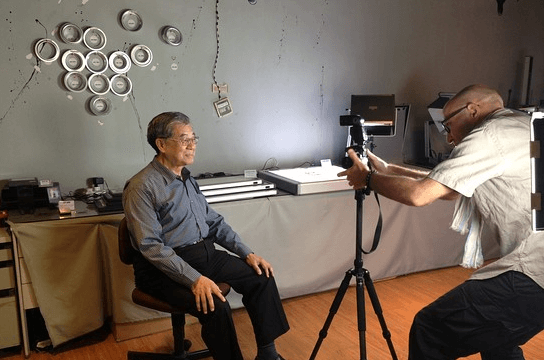 HF: This interview with the 84 year old creator of Holga cameras, TM Lee, was conducted by Manami Okazaki in Mr Lee’s office in Hong Kong in February 2014. The interview has been slightly adapted. He talks about Holga’s history, including why the camera never sold in China, and the company’s efforts to stay afloat amid the slow demise of film. Can we talk about your background? In 1966, I was employed by the Japanese camera factory Yashica, which at that time was really famous. I was their factory manager in Hong Kong. I stayed at the company for a few years, and then I left and teamed up with my brothers to start what was then called Universal Optical Industry. What were your initial products? We made electronic capacitors [for radios]. But after we started, there were so many people that were also doing the same thing, we had to find something else to do. It was suggested that we make a flash unit. There were not that many companies making flash units–only one called Maxwell, which was the first one in Hong Kong, and they were enjoying very good business. Where were the consumers of the flash unit based? First it was for the local market, but we also introduced it to other countries. Agfa heard about us and they asked me about producing the flash unit under the name of Agfa. Well, of course! They also helped us to organize our production from the beginning to the end. They helped us very much. We enjoyed a good business into the 70s for about 10 years. And it was not only Agfa, but also other companies from the states. But something changed by the end of the 1970s–a company called Konica, the camera manufacturer, introduced a camera with a built-in flash. Our business declined fast. I had to figure out a way to survive, so I started producing other products. A camera was one of them. I heard that Holgas were initially meant for mainland Chinese who couldn’t afford high-precision cameras. In the early 1980s China had started to open. At that time China had a few of its own [state-owned] camera factories, which were very big. Their products were also very good and they were selling them for a high price. [But] it was difficult for the masses to buy them. [Chinese companies] also produced 120 film, so that is why I intended to produce a 120 camera. But after I introduced the camera to China [consumers] changed their minds. They didn’t like the 120 film; they wanted to get something from outside world. The most popular film abroad was the 135. So my plans were destroyed and we didn’t even sell one piece in China. I had to change my mind and introduce the camera to the outside world.